Herakles (Hercules) was a divine hero, the demigod son of Zeus and Alcmene. Omphale was a beautiful and powerful queen of Lydia. Wishing to expiate the murder of one of his friends, Hercules consulted the oracle of Apollo, who advised him to enter the service of Omphale, Queen of Lydia. Although Hercules was the son of Zeus and was famed for his invincible strength, he submitted to the tasks the queen devised for him to expiate his crime. There are many references in text and art to Heracles being forced to do women's work and even wear women's clothing and hold a basket of wool while Omphale and her maidens did their spinning. At times Omphale even wore the skin of the Nemean Lion and carried Heracle's olive-wood club. 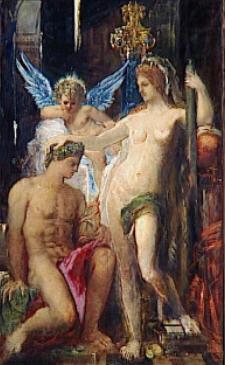 Omphale fell in love with Hercules for his strength and physical beauty, and the couple married. Rather than feminizing the hero, these stories tend to reaffirm his masculinity. 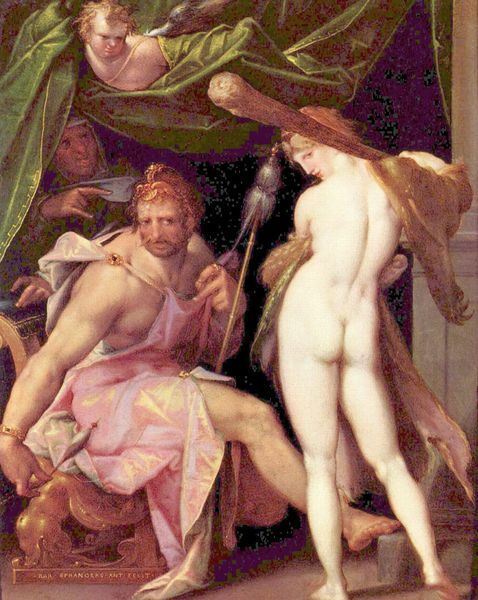 Ovid's Fasti relates the story of Hercules' cross-dressing while in servitude to queen Omphale. As the episode opens, Faunus sees Hercules and Omphale walking together and is immediately aroused by the queen's beauty. Later that evening, the couple enters a cave in the grove of Bacchus, and Omphale dresses the hero in her own clothing. When the couple exchange clothes, the poet emphasizes the gap between Hercules' rampant maleness and the female clothing that he dons. Hercules' body is so big, so powerful, so masculine that it cannot be contained by his feminine costume: the belt is too small for his belly; the fine tunic cannot hold his hands; his huge arms break bracelets that were not made for them; and his big feet tear Omphale's tiny slippers. While the absurd image of a Hercules who bursts out of his clothes is appropriate for the comic register of the tale--the episode is introduced as antiqui fabula plena ioci ("a story full of old-fashioned jokes")--it also draws the reader's attention to the virile hero who lies beneath the feminine finery. in our Famous Lovers Jigsaw Puzzles, located Here and Here. the Herakles and Omphale Tile Swap Puzzle in our Tile Swap Puzzle section.